The ultimate in chic sophistication, this range of ornate long stemmed glass flowers are an elegant addition to any beautiful home. Murano Store produce murano glass vase flowers, table flowers, small glassflowers and floral compositions handmade and presented in silk covers. 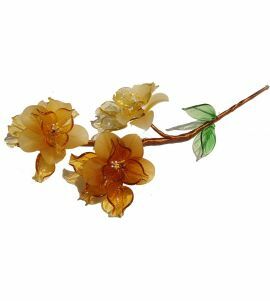 We offer a wide choice of delicate glass flowers to decorate your table and murano glass flowers the glass vases in your home decor. 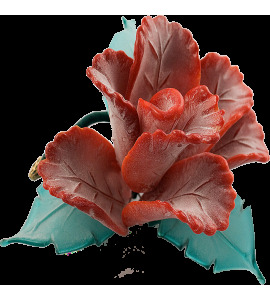 These beautiful works of glass art are ideal for a floral arrangements and bouquets offered wedding favors at your wedding day ceremony. As with all glass from the Venetian island of Murano, these flowers have been hand-made using traditional glass-making techniques. Glass has been produced on the island of Murano since the 11th century and is known around the world by those of high taste to include some of the most beautiful, ornamental glass objects in the world. The range of stemmed glass flowers at the Murano-Store includes Orchids, both for use in a vase and for lying on a table as an ornament, as well as Dahlias and Bocciuòlo, both designed to be placed in a vase. The glass petals have been produced using the traditional Lampwork technique, also known as Lume, whereby craftsmen mould the glass in front of a lamp. These technique is common in luxury ornamental glass objects such as miniature animals and flowers. 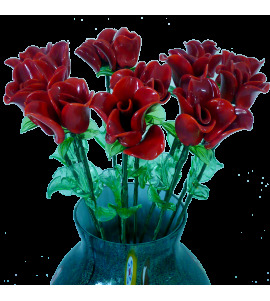 The flowers have been finished by hand with the addition of silk to make leaves and decorate the stem. Those with exquisite taste always look for the quality of hand-made Murano Glass. These long stemmed glass flowers are an ideal accompaniment for glass vases and add an instant touch of sophistication to any home. We offer delicate orchids, dahlias, Wisteria, lilies and bougainvillea flowers as well as beautiful roses which will fill your decor with color. Choose a composition centerpiece, a bouquet of flowers matching your furniture and table arrangements or mini flowers as as decorations and favors for wedding receptions or parties. Elegance, quality and refinement are all present in these precious handmade glass objects as well as authenticity certificates from our factory in Murano, Venice. 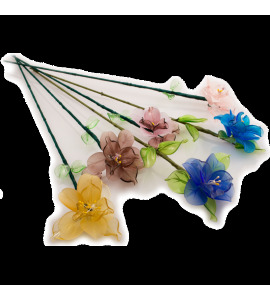 Buy now your favorite long stemmed glass flowers!